This entry was posted in Health & safety solutions on 2017/10/04 by Susan. The next three months are the most dangerous for driving. If you drive for work, make sure to plan for safety, prepare your vehicle, and slow down. Last winter’s extreme conditions in B.C. caught many drivers by surprise. October, November, and December are the most dangerous months for people who drive for work. Almost 30 percent of all work-related crashes resulting in injury and time-loss claims occur during these three months. Because of the severe weather last winter, WorkSafeBC claims for injuries and lost time were up 38 percent in 2016 compared with 2015. These numbers come from B.C.’s Winter Driving Safety Alliance, creators of shiftintowinter.ca. They also point out that the average number of casualty crashes (where someone is killed or injured) due to driving too fast for conditions doubles from October to December. Between 2012 and 2016, an average of 260 casualty crashes occurred in December compared to 130 in October. Personally, I hate driving in snow and avoid it whenever I can. I talked about this in my post Help for the snowphobic. But that’s not always possible. “Depending on where you drive in the province, winter road conditions vary, from snow and ice in the north and on high mountain passes, to rain and fog commonly found in the Lower Mainland and southern Vancouver Island. 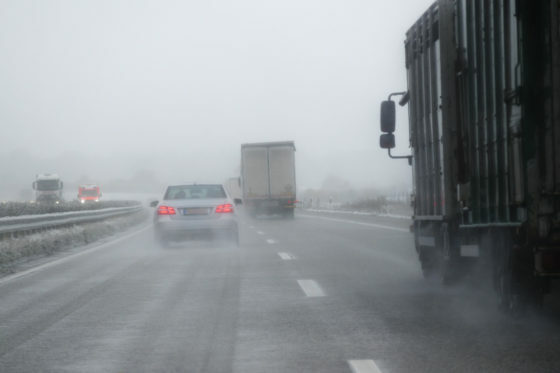 Drivers need to prepare for the possibility of changing road and weather conditions, and adapt,” says the Winter Driving Safety Alliance. Don’t go – If conditions are bad, postpone your trip if possible. Plan your trip – If you have to travel, check road and weather conditions and select the safest route. You can do this at DriveBC.ca (keeping in mind that conditions can change suddenly). Give yourself extra time to get to your destination to avoid rushing, and have an emergency plan for if you get stuck. Prepare your vehicle – Install a set of four matching winter tires and keep a winter emergency kit in your vehicle. Every year, be sure your vehicle has had a pre-season maintenance check-up. Slow down and drive to the conditions – Even the most confident and seasoned drivers are at risk in hazardous road conditions. The posted speed is the maximum under ideal conditions. Slow down to match road conditions and maintain a safe following distance (at least 4 seconds) between you and the vehicle ahead. Employers are responsible for planning for the safety of their workers who drive during a shift. For more detailed information, see the Winter Driving Safety online course and Employer Toolkit on the Shift Into Winter website. Do you have an emergency car kit?